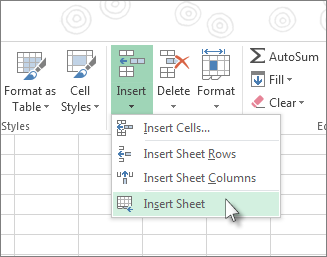 In Excel, you can easily insert, rename, and delete worksheets in your workbook. Select the plus icon at the bottom of the screen. Or, select Home > Insert > Insert Sheet. Double-click the sheet name on the Sheet tab to quickly rename it. Or, right-click on the Sheet tab, click Rename, and type a new name. Right-click the Sheet tab and select Delete. Or, select the sheet, and then select Home > Delete > Delete Sheet. Note: Sheet tabs are displayed by default. If you don't see them, click Options > Advanced > Display options for this workbook > Show Sheet tabs. To quickly insert a new worksheet at the end of the existing worksheets, click the Insert Worksheet tab at the bottom of the screen. To insert a new worksheet in front of an existing worksheet, select that worksheet and then, on the Home tab, in the Cells group, click Insert, and then click Insert Sheet. Tip: You can also right-click the tab of an existing worksheet, and then click Insert. On the General tab, click Worksheet, and then click OK. Note: To change the order of the worksheets in a workbook, click the tab of the worksheet that you want to move, and then drag it to the location that you want. Hold down SHIFT, and then select the same number of existing sheet tabs of the worksheets that you want to insert in the open workbook. For example, if you want to add three new worksheets, select three sheet tabs of existing worksheets. On the Home tab, in the Cells group, click Insert, and then click Insert Sheet. Tip: You can also right-click the selected sheet tabs, and then click Insert. On the General tab, click Worksheet, and then click OK.
To change the order of the worksheets in a workbook, click the tab of the worksheet that you want to move, and then drag it to the location that you want. What and where is the Microsoft Backstage Button? For more information about the Microsoft Backstage Button, see What and where is the Backstage? In the General category, under When creating new workbooks, in the Include this many sheets box, enter the number of sheets that you want to include by default when you create a new workbook. If needed, create the worksheet template that you want to base a new worksheet on. Select the worksheet that you want to use as a template. Under Info, click Save As. In the File name box, type the name of the worksheet template. To create a custom worksheet template, type the file name that you want to use. To create the default worksheet template, type sheet. Note: Custom templates are automatically saved in the Templates folder. The default worksheet template, sheet.xltx or sheet.xltm, should be saved in the XLStart folder, which is usually C:\Program Files\Microsoft Office\Office14\XLStart. On a computer that is running Windows Vista, in the list, click Excel Template or Excel Macro-Enabled Template. On a computer that is running Microsoft Windows XP, in the Save as type box, click Excel Template or Excel Macro-Enabled Template. Right-click the sheet tab of a worksheet, and then click Insert. Double-click the template for the type of sheet that you want. On the Sheet tab bar, right-click the sheet tab that you want to rename, and then click Rename Sheet. Select the current name, and then type the new name. Tip: You can include the name of the sheet when you print the worksheet. In the Page Layout View, click the location where you want the sheet name to appear. In the Header & Footer elements group, click Sheet Name . Select the worksheet or worksheets that you want to delete. On the Home tab, in the Cells group, click the arrow next to Delete, and then click Delete Sheet. 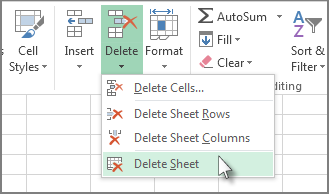 Tip: You can also right-click the sheet tab of a worksheet or a sheet tab of any selected worksheets that you want to delete, and then click Delete Sheet.